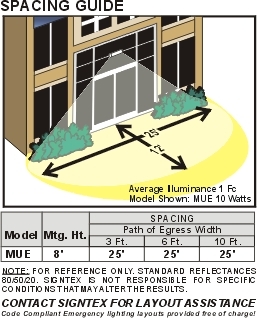 MUE Series - Mullion Mount - Signtex Lighting Inc. Designed specifically to mount directly on extruded structural mullion beams used in typical glass-frontedentrances and other dividing walls. 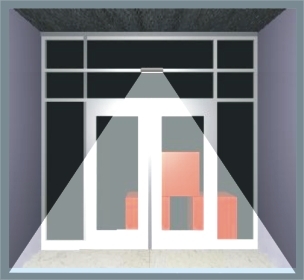 This unique and very low profile fixture will fit directly on to a 2 ½” high surface and provide extremely efficient emergency and general lighting over the path of egress. 10 & 20 watt models available, with 10" & 20" lengths. Rugged extruded aluminum housing with stainless hardware is corrosion proof. Wet location listed UL 924 and IP66. RE= Central Battery System Series CBS or other qualified source 12V- 24 VDC. BB= Battery backup from Remote Battery Supply Series RPS. as well as emergency lighting. Very low power consumption in night/ security mode. This unit offers tremendous energy savings when compared to any fluorescent or incandescent lighting systems during night operations. Over 50,000 hour lamp life in normal use. An advanced LED driver module is incorporated in the fixture, allowing dual operation from the Signtex central battery system for both emergency and general lighting. Lamps are connected in parallel-series strings, as required to meet requirements of NEC and Life Safety Codes. Lighting continues even after failure of one lamp or circuit.